Dawn-over-the-Lagoa-7524, originally uploaded by Paradise in Portugal. We’re in the middle of re-designing this website, (so watch this space! ), and our webmaster has been carefully chosen as living right next door to one of my favourite birding locations, the Lagoa Santo André. 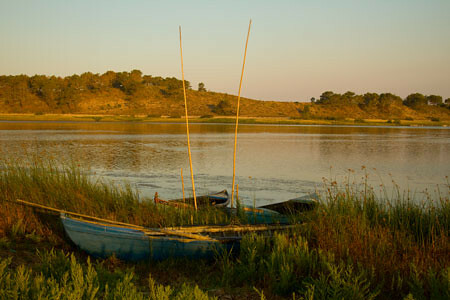 This time of year’s pretty busy at the Quinta, so meetings to discuss the design are invariably held early in the morning so I can be back here before lunch, and it was on one of these early mornings that i got this lovely shot of these traditional fishing boats on the shores of the lagoon. We’re at the Birdfair again! See you there!, originally uploaded by Paradise in Portugal. 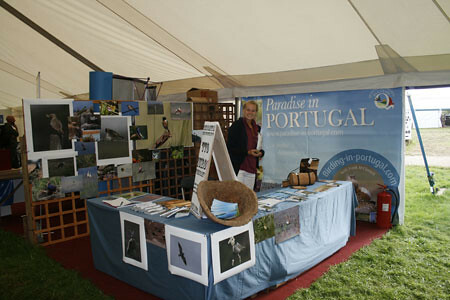 The Birdfair looms – it’s Friday, Saturday and Sunday the 20th, 21st and 22nd of this month at Rutland – and we’re there again promoting Portugal. Stand 93 in Marquee 4, a slightly different position from the last few years but near enough to find us easily again for anyone who wants to come and have a chat, so we’ll look forward to seeing you there. Oh, yes, before I forget; I, Frank, will be giving a lecture on the best places to watch birds in southern Portugal on the Sunday morning at 9.30, so drag yourselves out of bed for that one as it’ll be worth it for anyone wanting to minimise lost time on a holiday down here.